At this point, Exhumed may not expected to go into any new directions, but that doesn't make them any less fun to listen to. Early-90s Carcass inspired them and they can always go back to the same well for more, but it's hard to get tired of it when they're not only so technically good at their gore-spattered brand of deathgrind, but also celebrate it without taking it too seriously. On Death Revenge, they're clearly enjoying themselves, and the listener will too. This time we've got a concept album about the Scottish "resurrection men" who started by stealing corpses for unethical anatomists in the nineteenth century, and eventually went to the logical conclusion of "making" corpses through murder -- needless to say, a perfect Exhumed subject. To avoid the listener's getting lost, the band stuffs quotations and narration referencing the song's material in the album notes, but the vocals themselves are kept short, mixing narration with quotes from the three villains of the story -- Burke, Hare, and Dr. Knox -- revealing their possible states of mind as they descend further and further into murder and evil. Paired with their croaked utterances are the high-quality, lightning-fast guitar duels of Matt Harvey and Bud Burke, on top of some seriously legit riffing. We get a pretty diverse showcase of their work: We get some death-and-roll on Unspeakable, and early-Slayer-style riffing on Night Work. More than a concept album, Death Revenge is structured like a musical, one of the only musicals I could see myself going to see. By the middle of the album, Burke and Hare are already reasoning that it's too much of a hassle to dig up the bodies and bribe the keepers of the graveyards, -- after all, everyone's going to die sometime, and they're just making it a little quicker. A less confident band would try and make this as serious as possible, but the band can't resist putting in things throughout the songs' lyrics like "My occupation was a'calling, like a tumor, it within me swelled", or "These are dirty deeds, six feet of dirt, dug dirt cheap". The sick humor doesn't detract from the album, any more than the cheap horror-movie album cover, and the ever-climbing lead riffing on Incarnadined Hands puts a melodic spin on the riffing that gives it added climax at the culmination of the album. After that, the bonus track, a cover of Exodus' A Lesson in Violence, seems pretty tame; Exodus already did it well, and compared to the lofty original creations of Exhumed, their cover seems more paint-by-numbers than blood-splattered masterpiece. But no matter. 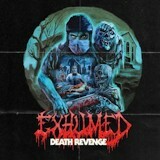 Anyone who liked what Exhumed did before is sure to like Death Revenge, and for those who never dug gore metal, this latest one is surprisingly listenable.